Water soluble acrylic micromolar primer, ideal for the preparation of surfaces to be coated with white or colored plasters. It presents high penetrability and it impregnates surfaces without creating a film. It does not corrode surfaces and it reduces effectively their absorbency while maintaining their breathability. It ensures plaster protection from premature surface drying (early dehydration), eliminates the reduction of strength and the risk of crack creation. 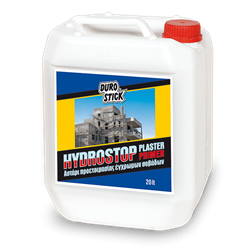 Apply it on highly porous substrates, such as base coat plasters and aircrete before the application of white or colored plaster. It also ensures even drying and color uniformity across the entire surface of the new plaster. 1lt/10-12m2, depending on the absorbency of the substrate and the dilution rate.